Innovative Publications for Horn Players, and More! Sponsor of the Horn Notes Podcast, available on iTunes, Spotify, etc. Available on iTunes, Spotify, etc. One of the most visible hornists today, John Ericson has wide-ranging experience as an orchestral player, soloist, and teacher. 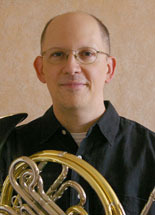 Co-founder of the online magazine and resource Horn Matters, Ericson began his professional career with serving for six seasons as Third Horn in the Nashville Symphony. From there, he turned to full time teaching, first at the Crane School of Music (SUNY Potsdam), where he launched Horn Articles Online. Since 2001 he has served on the faculty at Arizona State University and is Brass Area Coordinator. Besides teaching at Arizona State University, in recent years Ericson has also served as artist faculty at the Interlochen Center for the Arts and the Brevard Music Center. He holds degrees from Indiana University, the Eastman School of Music, and Emporia State University. His three solo CDs on the Summit label received critical acclaim: The Horn Call hailed Les Adeiux for "Fantastic playing.... The level of musicality, nuance and artistry is not to be missed" and called Canto a "Terrific collaboration between horn and piano." Author of numerous publications, he has performed and presented sessions at eight international horn symposiums and numerous regional events. A longer bio with audio samples may be found in Horn Matters.